Listening Ability in Order to Understand - From time to time, various media broadcast actions that are based on sentiment towards a particular group. Ranging from sentiments related to religion, race, gender and sexual orientation, ideology, personality, morality, and so on the color the news in various countries. Inevitably, this makes some people tired of consuming content in mass media and social media. Meanwhile, for some others, these are all triggers of reactions to attack or defend themselves. Not a few who equip themselves with the publications sourced from the point of view and on certain interests to feed other groups who contrary to him. Closing your eyes and ears to other facts around makes some parties go crazy and blindly others by screaming because the person refuses to agree with them. 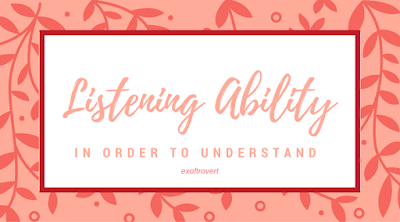 When others try to explain the argument, they will "look like they listen", but their minds are wandering off to other things, except the introvert. "Most people do not listen in order to understand; they listen with the intention of replying to the other person's speech," said Stephen R. Covey, author of The Seven Habits of Highly Effective People. What Covey says is relevant to today's situation, such as fanatical or extremist actions that often justify the ways to quell the opposition. Without wanting to know further the arguments of people who have different perspectives and without the will to evaluate his beliefs, he will continue to defend what he believes to be a single truth. Now, the only one who wants to listen is an introvert one. Of course, not listening occurs in any other context. In work meetings, parent-child relationships, romantic relationships, or social spheres, the absence of a listening intention may be the trigger for major conflicts in the future. Another example of low listening is when an emcee or interviewer asks the resource person and is unresponsive to the answer. Instead, he immediately threw in another question that was already implicit in the previous answer by the resource person. It is not impossible that this raises the suspicion of the source person, "does he really listen to what I say?" Other kinds of perceptions are pluralized for those who do not listen to their interlocutors, even interrupts: impolite or appreciative of the speaker, lazy, unaware of what is being said, or selfish. Behind these assessments, there are several reasons that actually underlie reluctant listening. John M. Grohol, Psy.D. writing on the PsychCentral website, in addition to feeling self-righteous, people also do not want to listen because he feels his opponent is less credible or unbelievable. Another thing that also encourages low listening intentions is the fear of being criticized by others. Ignoring people's words becomes a form of self-defense mechanism that actually inhibits its development. In addition, there are people who feel they should be able to help others who come to them and tell some of the problems they are facing. Instead of listening carefully, these people actually stimulated to continue to talk and give advice as that was the most needed people who are in trouble. External factors can also encourage people to close their ears. Group pressure and conformity may make people determined to bounce the arguments of other groups. 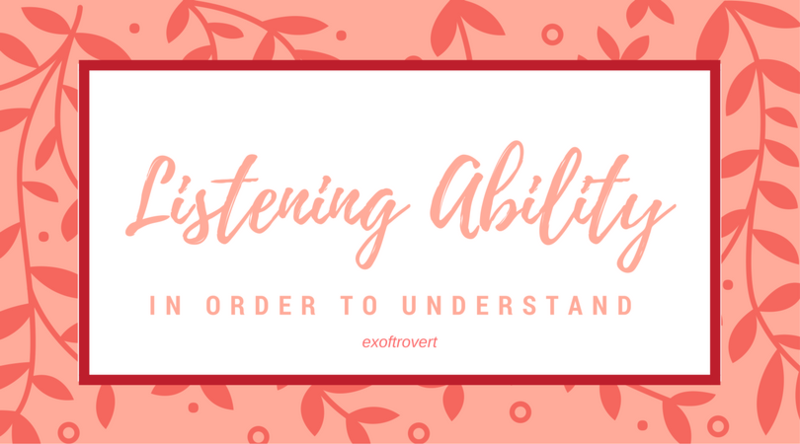 The lack of listening ability that is crucial to various aspects is not just a guess. Ralph G. Nichols and Leonard A. Stevens wrote in the Harvard Business Review some of the findings related to listening ability after researching thousands of students and hundreds of business and professionals. In their experiments, each respondent was asked to hear a brief conversation college staff and soon after, the respondents have tested how well they absorb the content. As a result, only about half the content of the conversation that the respondents remembered. Two months later, the respondents' memories related to the conversation were reduced to 25%. In fact, according to Nichols and Stevens, in eight hours, people tend to forget about a third to half the information given by the speaker. From these findings can be obtained a number of interpretations. First, many people just listen, not listen.